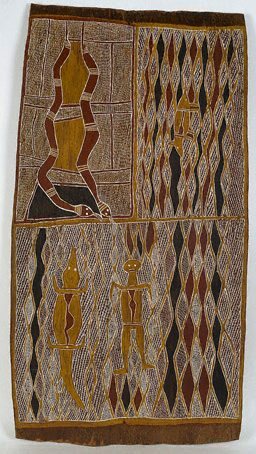 Munggurrawuy Yunupingu's bark paintings are complex, many layered narratives pertaining to the creation of the Gumatj homelands in north east Arnhem Land. The diamond shaped miny’tji (sacred clan designs) are distinctive to Yirritja moiety artworks. In these paintings, the journeys and actions of ancestor beings are revealed, accompanied by motifs representing the transformation they wrought up on the landscape, such as the smoke and ash of fires, footprints, thunderclouds and rain.